Sam didn't look up from his phone as his student swam her laps. He'd been teaching Whitney for over a year now, and she had picked up swimming like she'd been born in the water. After losing her parents are murdered Whitney is forced to live with her aunt and cousin but they don't really notice what she's up to. She's been taking swimming lessons with Sam one of the instructors that's she had a crush on for over a year. When a swimming lesson goes south quickly Sam is forced to give her a little of his blood so that she doesn't die, but he didn't know it would turn Whitney into a mermaid also. Whitney thinks she knows why she was transformed into a mermaid because she wasn't always a day human. After losing her parents she also loses her skinwalker ability, turning her into the day human everyone suspects. She has lots of questions and hopes that Sam will have the answer to them all. Only he's determined to keep her a secret from his fellow sirens in order to protect her life. I like Whitney a lot, she's sweet but she can take care of herself and accepts the transformation of her fishie tail. I wasn't sure about Sam at first because he's keeping the truth about her a secret. However, as the book progresses it's clear that they are meant to be together and need each other. I like the sweet chemistry between the two it's a clean romance with a little biting and whole lot of tails. I've had this one on my kindle for a while because of the cover is just so pretty. 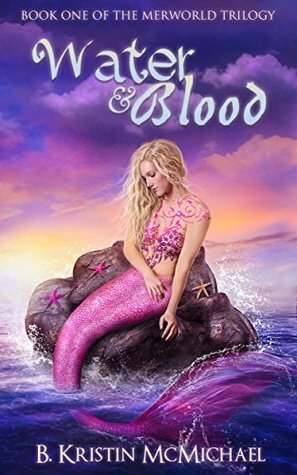 Water and Blood is a fast paced action packed sweet romance that captures the heart as well as the imagination. The concept for the mermaids is interesting the way the author has created two different kinds based on tail color and magical power plus they all drink blood. The characters are great I really felt like I connected to both Whitney and Sam as the author uses an alternating style. I enjoyed the author's writing style it flows from start to finish, it's easy to get lost in the story and hard to put down. I highly recommend checking it out because it's a new twist on the mermaid idea. Oooooh a story about mermaids! You don't see those very often. Gonna add it to my TBR, thanks! !